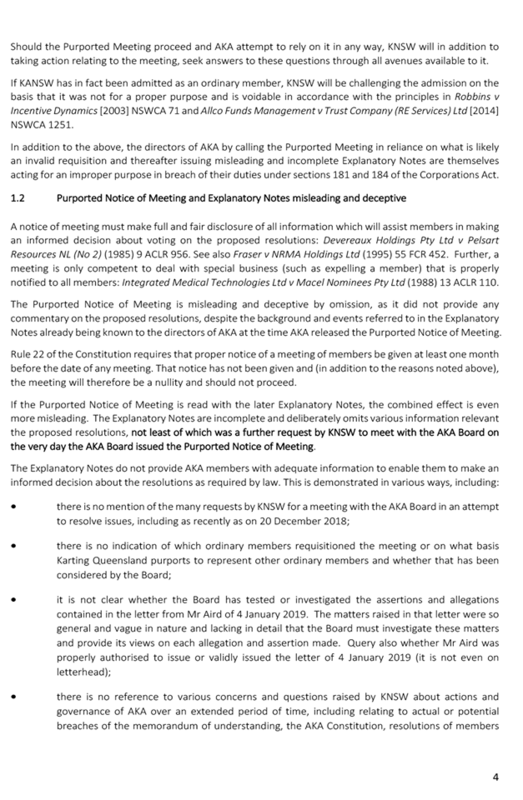 Yesterday (Jan 21), Australian Karting Association Ltd held a special meeting and elected to expel Karting NSW from the organisation (AKA Ltd is the trustee of KA’s Track Development Fund, of which KNSW and the other state associations are the beneficiaries. 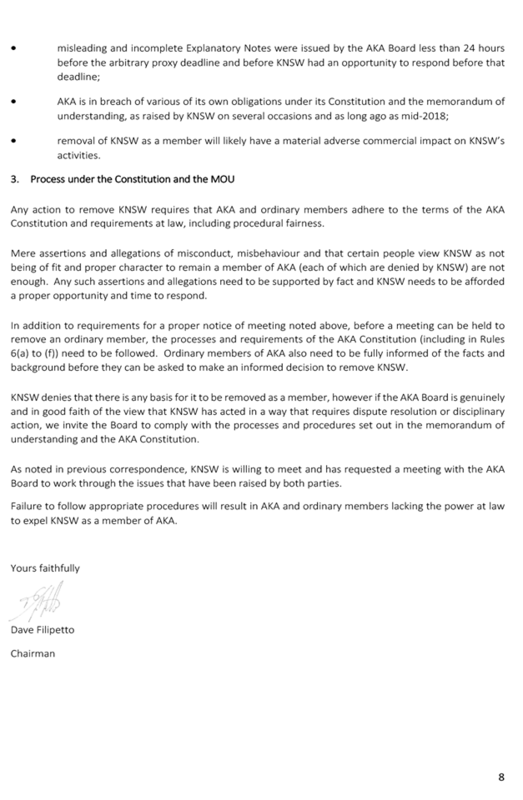 KNSW disaffiliating from AKA Inc is a separate matter). 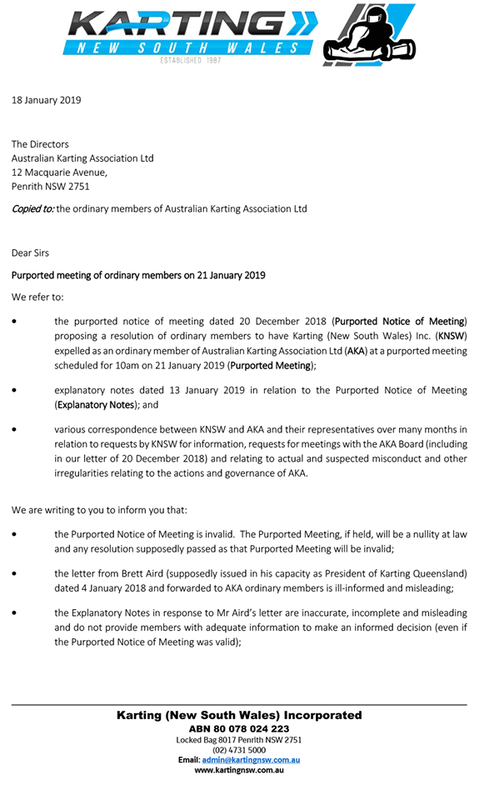 Just days prior (Jan 18), Karting NSW made public a letter sent to AKA Ltd advising the January 21 meeting was for improper purpose, illegal and any resolutions made would therefore be invalid. This whole situation has become a Royal Clusterf*ck. In recent months, both organisations have accused the other of being incorrect and publishing misleading information. They can’t both be right. 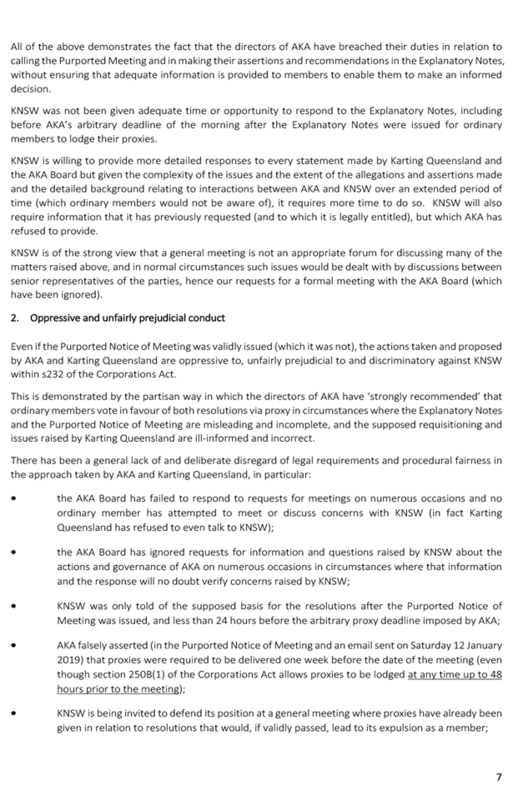 STATE ASSOCIATIONS VOTE OVERWHELMINGLY TO EXPEL KARTING (NEW SOUTH WALES) INC.
Members of the Australian Karting Association Ltd (AKA Ltd) have voted at a Special General Meeting (SGM) held earlier today to expel Karting (New South Wales) Inc. (KNSW) as an Ordinary Member of AKA Ltd, effective immediately. 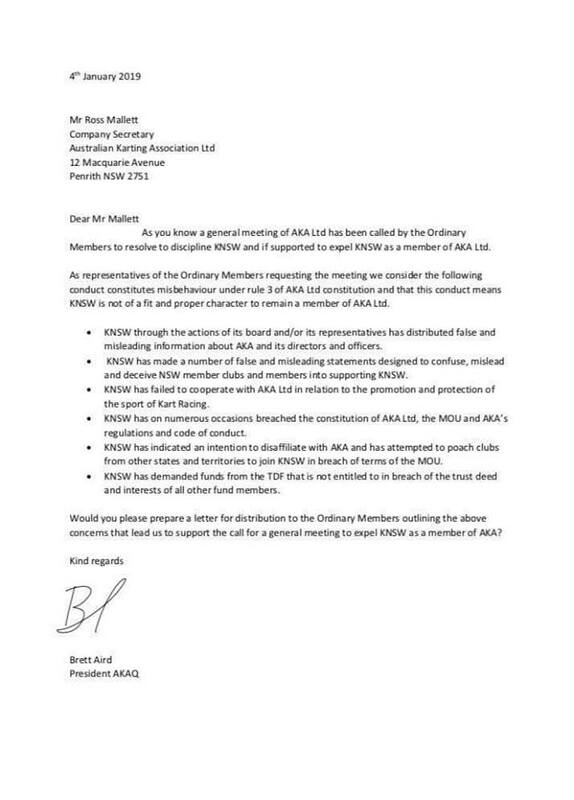 The SGM was called under a formal request from AKA Ltd’s affiliated State Associations (Ordinary Members) under Section 249D of the Corporations Act 2001. 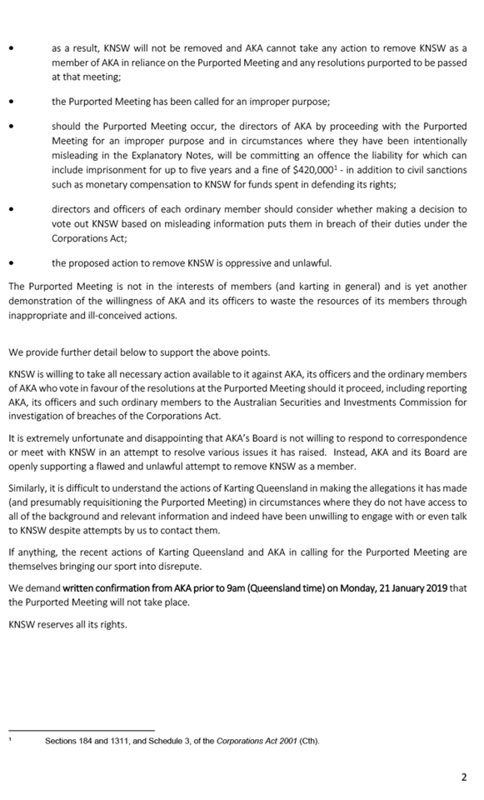 KNSW and the Ordinary Members were afforded the opportunity at the meeting to argue the cases for and against the expulsion of KNSW. 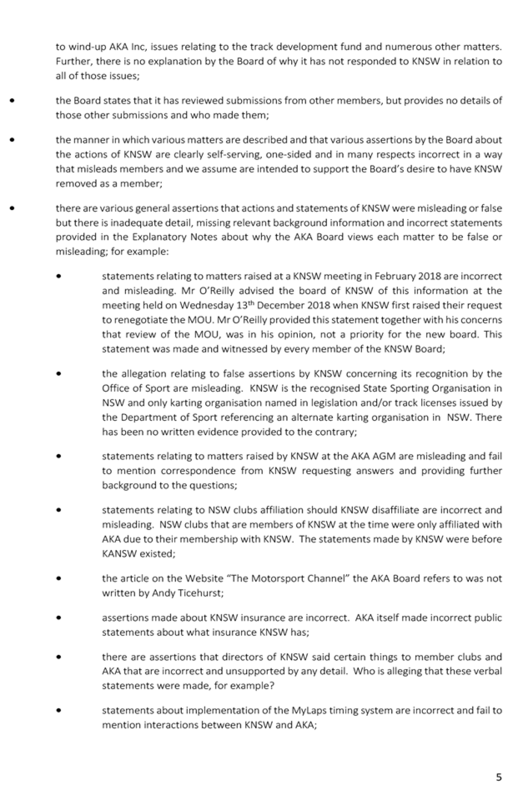 Whether or not Karting NSW should be expelled as an Ordinary Member of AKA Ltd.
KNSW will immediately cease to be part of the AKA Ltd. KNSW member Clubs also immediately cease to be an Associate Member of AKA Ltd.
Members of those Clubs that are members of KNSW now face the decision of which Club to join for 2019 should they wish to compete in Australian Karting Championship, State Championship, and all other AKA sanctioned events. 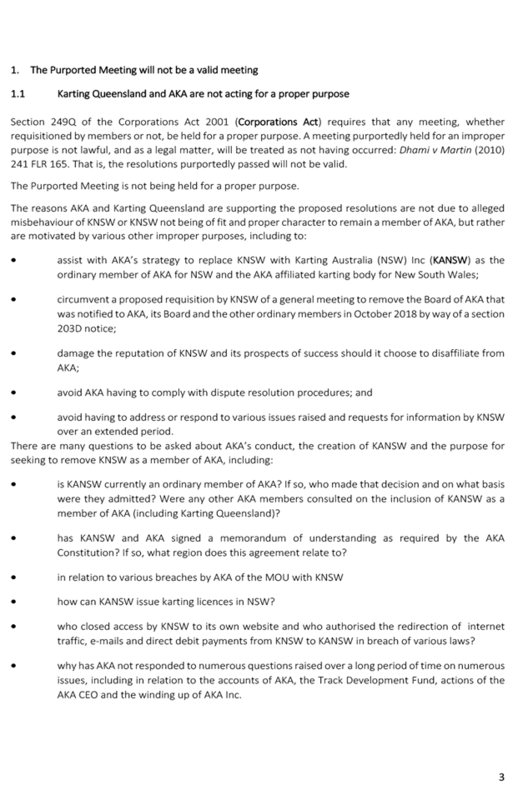 Affected KNSW Member Clubs wishing to retain the benefits and privileges that come with AKA Ltd affiliation are eligible to apply to affiliate with the new State Member of AKA Ltd, Karting Australia (NSW) Inc.
Parties must meet to resolve issues. Having a mediator appears necessary. This needs to actioned quickly. 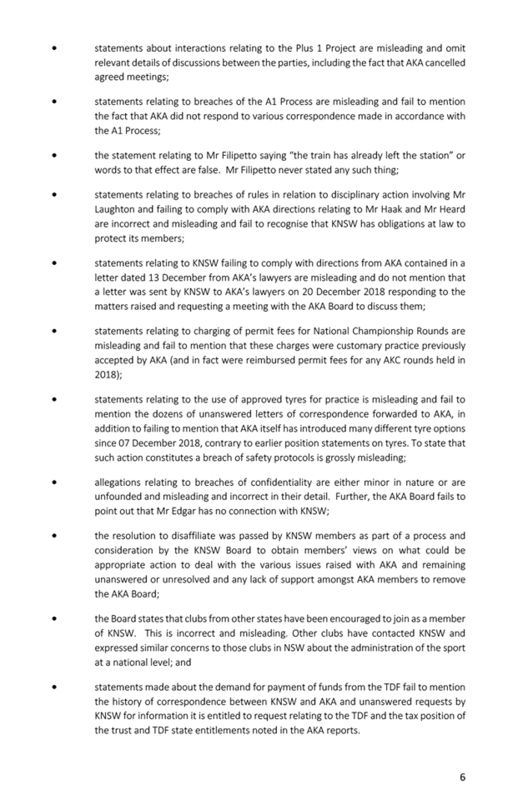 Indecision now is causing great damage to all members. Ian Klauss on Karting Introduces Its Own Currency!